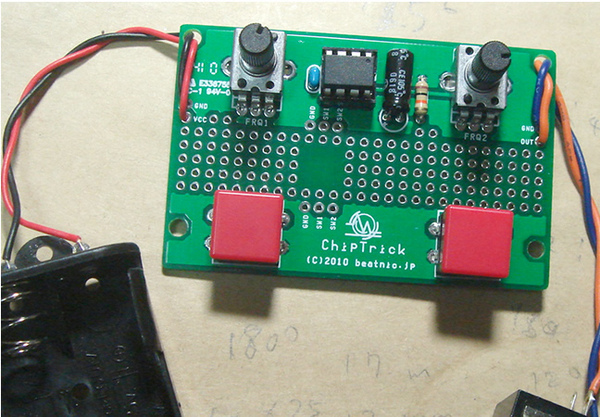 Chip Trick is Noise Machine that’s developed for the beginner of electricity. The total amount of parts is just around 10 or so. If you have enough tools for DIY, then you can finish it within an houer or so. We need something amp (and speaker) to get sounds. but this kit also have easy speaker drive option. Putting this options, you can play this by stand alone. The sound that this machine re-produce is almost like NFS. there is 3 mode that can be changed by combinations or power swith and another switchs. Using 2 sets of knob and bottum can get some sound variations. The pitch of noize can be chandged by 0-5V CV that comming from outside of this kit. By using the MIDI-IF kit that’s sold separately, you can use this from MIDI. but you may need some mod to do that.